Any new album from a performer described by The Guardian as “one of the great singers of any genre” is an event in itself, but this time, June has chosen a programme of material reflecting her two great passions – music and the land. The material is drawn from an extraordinarily varied range of sources ranging from Tchaikovsky to Les Barker, from the 15th Century to the present day, from the esoteric to the beautifully simple. All centre on tales of the rose; whether sacred, secular or as a symbol of love. 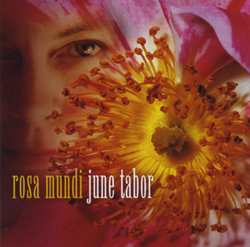 Rosa Mundi, June Tabor’s celebration of the rose, re-enforces her standing as a singer of considerable importance with a startling ability to imbue material with clarity and exquisite beauty, using a voice that, over a thirty year period, has won her world-wide admiration and acclaim.